While using firefox 3.0.11, foxgame 1.5.1 and Galaxytool plugin 2.2.2 I am getting this error when trying to send Esp Reports. Also the tool will not show up unless I go to resources page and when it does it errors out foxgame with 25 errors and then shows the GTP but it says building page. I'm sure I have something messed up but I am not sure what it is. first of all, disable Foxgame for testing and restart firefox for that to take effect. Also make sure that you have entered valid domain names/url user and password according to the manuals. What universe/ogame language are you trying to use the plugin on? At least one report failed! Maybe I'm doing something wrong but what? Mybe I'm doing something wrong but what? So are YOU using any other browser plugins for Ogame (like Foxgame)? This happens to me when an espy report is copy-pasted into a circular or PM so it is incorrectly formatted. However my own espy reports are saved fine. Also I can copy-paste the forwarded espy report into the database manually and that works fine too. For some reason it seems to pick up forwarded espy reports from inside messages, but doesn't know what to do with them once it has detected them. To the OP: I am using the same firefox version and same foxgame version as you and gtoolbar 2.1.9 with no problems. I know its probably not helpful as I'm not on the beta server, but in the old version at least there seems to be no issues with those foxgame or firefox versions messing up the gtool. I will see if I can get 2.2.2 and test it. Warning: Toolbar 2.2.2 will not work on non-redesign universes (Ogame version 0.84) !! Yes, I'm using foxgame but i try turn off it but esp reports don't save..
oky i find some scripts (ogame smiles,...) and delet all. now galaxytool status showing: Unexpected result from server! maby now you can help me? I make screen, maby you can see what is problem. how did the total ressources diasplay get in there (the orange line) ? greasemonkey scripts can also block uploading. please disable that one as well. If you can get another script or modify this one so that the total resource display / needed transporter display ist at the bottom not in the middle of the esp. report it may work, but not with that one manipulation stuff inside the report . that orange line is foxgame option..
My friends have that problem too, i think the problem is in latvian language, maybe there are some mistakes. 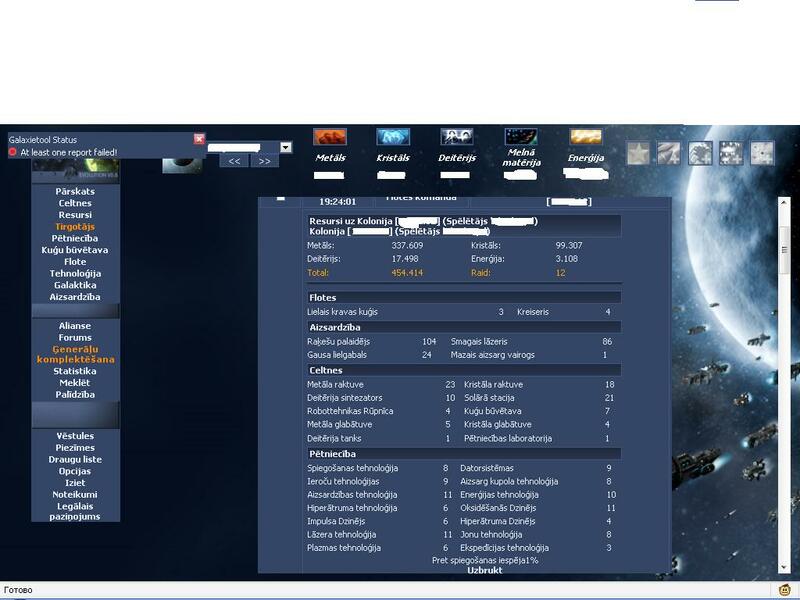 there is a bug in ogame for latvian. You see ? All information on the one line above "metal". Including the time when it was taken. This information is not there for latvian somehow. I looked in latvian_probes file and find 2 mistakes in translation. the link above is the url to insert into the plugin. also I'd like you to report the translation errors in lativian probes files in the Bugtracker. Thanks.